Opportunist Deuce McNamara considers himself The Man in the Moon. The former bagman for the Borgioli clan on Moonbase Vegas works every angle he can and comes up aces. Now the right-hand man to Hunter Castle, the wealthy businessman and owner of the new casino, Darkside City, Deuce spins in an orbit of riches and power. 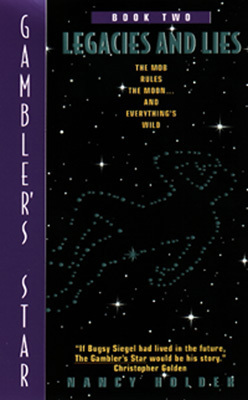 But when a powerful explosion rips apart Castle's fabled spacecraft, Gambler's Star, Deuce's world spins out of control. The lunar St. Valentine's Day-style catastrophe has rubbed out the top echelons of the Six Families that control the Moon and Castle himself, leaving Deuce in the middle of the bloodbath to end all bloodbaths. As the Families savagely pursue their vendettas and the rebels of the Moonsider Liberation Front launch a campaign of terror, it is up to Deuce to intervene, stop the slaughter and prevent puritanical Earthsiders from imposing a tyranny of decency on the Moon.